When I think of s’mores, I remember warm summer nights with family and friends gathered around a glowing campfire, a blanket of stars overhead, and laughter. I still love the evocative flavor of s’mores but I don’t want to eat an actual s’more every day. That’s where this recipe for S’mores Shakeology comes in. It captures the summer’s iconic flavor, and I can drink one every day! A scoop of Chocolate Shakeology gives the S’mores Shakeology a rich, chocolaty flavor, vanilla extract stands in for the sweet marshmallow, and real graham cracker crumbs blended into the shake and sprinkled on top are the finishing touch. Watch the video below to see how the classic version is made! And try the vegan version of this S’mores Shakeology recipe, too. Love the evocative flavor of s’mores but don’t want to eat an actual s’more every day? 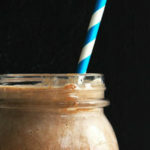 This S’mores Shakeology recipe captures the summer's iconic flavor in a healthy smoothie! Place almond milk, extract, Shakeology, 1 tsp. graham cracker crumbs, and ice in blender; cover. Blend until smooth. Pour into a serving glass and garnish with remaining 1 tsp. graham cracker crumbs; serve immediately.